Today my teacher showed us a picture of a shoe. I think it either looks likes a metal detecting shoe or a exercising shoe, i think it looks like a metal detector because at the front of the shoe there is something that looks like a button but it might be the bit that detects the metal, i think it might be a exercising shoe because on the side of the shoe there is a part that is orange and i think the orange part is the part that makes you exercise. I think it is made out of rubber, cotton and metal. 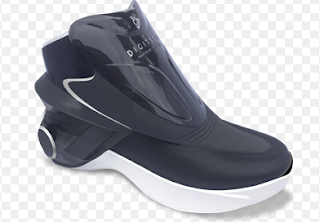 I think if it is a exercising shoe then it will help people get more fit and be like usain bolt. If it is a metal detector then when you find things then you can build things. Also if you find things like cups or fishing nets you can use them either outside or inside. When i thought it was and exercising shoe or a metal detecting shoe, i was totally wrong. It turns out that it was actually a smart shoe. Smart shoes have a automatic tightener, Smart shoes also have a smart heater which makes your feet warm, Smart shoes have lots more interesting facts about them but there is just too much. I think it is a really good idea because it is so useful. If i saw them in a shop i would most likely buy them. I would like these fantastic shoes to be able to make these make you run fast.